Archives of Eaton Bray News for January 2008. This article was published in January 2008. Please see Latest News for more recent information. With a much improved Dragons team as opposition it took Lions a while to settle down but after the first two goals from Harry and Charlie things were looking good. A more compact Lions' midfield meant that George and Jack had more of the ball and playing wingers Harry and Charlie less wide gave Lions the vast majority of the first half possession with a lot more opportunities to score. Freddie adjusted to his role as sweeper well and was MoM. In goal, Toby always looked a safe pair of hands dealing with anything that came his way. Lee and Karl came on as wingers at half time and Dax and Lee soon scored. Lions dominated the second half and could have scored more. This week's goal scorers were Dax Roe, Charlie Giblin, Harrison Ambrose and Lee Saunders. A shearing cross wind which would facilitate play one end, hinder it from the other, ultimately led to the Lions' demise to one of the league's top performers. Nevertheless the boys submitted an indelible performance, replete with slick passes. MoM Sean fired the Lions ahead following a scything run, and the underdogs looked set for an upset. Lions demonstrated a handful of their sublime one-twos which foxed their accomplished opponents, and for most of the opening half Charlie and Chris, abetted by robust defenders James, Ben and Mason, ran rings around Sundon Park, delivering endless neat passes to the able feet of forwards Adam and Dominic. A rejuvenated Sundon Park emerged from the half time break with vehemence. By the final whistle, three goals had slipped in but Lions' keeper Dan had one of his best games to date, ably deflecting shot after almighty shot from an endowed Rangers strike force. The Lions returned to play Sundon two weeks after beating them in the Cup and were surprisingly beaten by the team currently second bottom in the league. The boys created a number of early chances but could not convert any of them, Sundon however scored twice in the first ten minutes. The Lions continued to push forward and looked the more likely team to score as half time approached however it was Sundon who netted for a three goal half time lead. The Lions played better in the second half with Captain Scotty Mercer pulling a goal back. The boys created many more chances but it was just one of those days. Sundon scored late on to wrap up the win. The Lions were out-muscled by a physical team who showed more desire for the victory. MoM for the Lions was defender Nik Challis who never stopped battling. In a very exciting and close County Cup Quarter Final, Division 1 Hatters drew first blood against Lions to edge ahead in the first half. Lions calmed the nerves with a well executed goal early in the second half from Jake Higgs, whilst Lions' defence stood firm closing down most Hatters attacks before conceding a weak goal to fall 2-1 behind. However, Lions rallied and from a corner Declan Tomlinson rose to bullet a header into the top corner to equalise. Extra time beckoned, but the last minute substitute, Ed McBrearty, made an exquisite 15-yard pass to Jake to cross for Will Sanders to power in the last gasp winner. Lions go through to the last 4 in the County!! The early play was restricted to the midfield but both sides started to make inroads on the opposing goal with both teams hitting the post. Lions seemed to change gear and took the initiative resulting in a great solo goal from Mel. Confidence increased and Lions continued to pepper the goal with great displays from Liberty, Georgia, and Steph in midfield and Amber Walsh upfront. The second half started brightly for Lions with Amber Wright smashing a goal into the roof of the net. Colts then re-grouped, but were kept at bay by some inspiring defending by Misha, Sarah Jane (GOM) and Holly, aided by the reliable "safe hands" Megan in goal. A long range shot was converted by Lions' Hannah who chased the ball down and beat the keeper on the rebound. The fourth goal (Mel's second) came as a result of a free kick by Misha to finish the game off. This was another great match. Lions were playing second in division Colts and knew that they faced a good team. Lions got off to a strong start and maintained the pressure right up until half time. Hattie and Darcy pushed the Potten defence to make a mistake and allow them to score. In midfield, Megan and Emily worked hard to keep the game moving forward. Katie and Devon, who was GoM, defended Lions' goal well and pushed up to help find a way through. Nancy looked confident in goal and made some great saves. The match continued at the same fast pace as the first half. After seven minutes Potten scored so Lions made changes to bring Darcy, Devon and Emily back on. Lions were still fighting for every ball and three minutes before time Hattie scored a well deserved equalizer. Teamwork, effort and determination enabled Lions to get a great result. Beds County Council says its tax burden will increase by 3.8 per cent from April. But this is the lowest increase in its portion of the council tax in a decade. It means a band D household will pay County Hall £1,123.46 - up from £1,082.33. The other 25 per cent of council tax payments goes to the police, the fire service and town and parish councils, which will be setting their budgets shortly. County council deputy leader and cabinet member for finance, Cllr Richard Stay, said: "The county council intends to keep its promise to keep council tax down and protect the services people tell us matter the most. This year's proposed budget will do that. "Yes, there will be financial pressures in services like older people's social care, because of increased demand linked to an ageing population, but I believe we are well placed to deal with these and protect services as much as possible. "We are also making sure that investment in public priorities remains strong. ""Surveys carried out in November told us that residents' main priorities have not changed, and that roads, community safety, care for older people and improving education were still services which mattered most to the people of Bedfordshire." Cllr Stay said the Government had this year given councils across the country the worst financial settlement in ten years. This means Beds and Bucks will once again get slightly less money from the government in real terms and year after year it's spending power is squeezed a bit more, forcing cut-backs. By economising it has managed to make savings of £15.4 million in the last two years, with another £4.9 million expected by the end of the current financial year in March. Council leader Cllr Madeline Russell claimed more savings would have been possible if it had not been for the uncertainty surrounding plans to cut away one layer of local government in Bedfordshire. The Government has said it is "minded to approve" Bedford Borough Council's bid for unitary status, effectively abolishing the county council and apparently paving the way for a merger of Mid and South Beds councils into 'Central Beds'. County Hall meanwhile has launched a judicial review and remains confident of turning the tables. Cllr Russell said: "The only way to keep council tax down and preserve essential services is through a countywide unitary authority. "Our plans are the only efficient and effective option on the table." South Beds District Council counters, however, that county is continuing to misrepresent the issues. It says the district councils' financial forecasts have been rigorously checked and it is untrue that creating two new all-purpose unitary councils in place of the present pattern would damage services and lead to increases in costs. South Beds says its detailed proposal is not based on cutting the budgets for frontline services. The government's decision, expected in late February on the future of all four councils in the shire. Across the border in Bucks, people living in Aylesbury Vale are facing an average council tax rise of 9p per week for the wide range of services they receive from the district council. At a meeting last Tuesday, AVDC's cabinet agreed to recommend a four per cent rise for 2008/9, which equates to an extra £4.83 a year on a band D property. Householders in band D would pay £126.04 for the year. A district council spokesman said the authority is planning to spend £20 million on services in 2008/9, of which £11.6 million will be provided by the government and £8.4 million will be raised through council tax. In addition, the cabinet is recommending a capital programme of more than £100 million over the next four years. About 10 per cent of each household's annual council tax is kept by AVDC. The rest of the bill goes to the county council, Bucks Fire and Rescue Service, Thames Valley Police and local parish councils. The final decision on the council's budget will be made on February 6. Get the Leighton Buzzard Observer every Tuesday. The Blues launched into play, spurred on by fervent supporters. Mid-fielders Connor Tough and Jack Reynolds instinctively stuck to the ball and drove it forwards, and with efforts from Toby McGee and Matt Kennell the ball danced around the box. It was only minutes before Matt scored the first of what would transpire to be an accomplished hat trick! The Whites, the slope in their favour, overturned the score to go 2 -1 up before the break. With the second half under way, defenders Daniel Challis, Sam Bramston and Bradley Hicks closed ranks and, together with sterling saves from Ollie Mulcahy, ensured the Whites had scored their last. The scare of the score-line unleashed the boys' fighting spirit and with Robert Bunting feeding the ball through, Connor sliced a shot behind the keeper. A blistering goal courtesy of David Wood and the feisty completion of Matt's hat trick combined to bring victory to the Blues and their jubilant fans. In this League Cup tie Lions faced a team two divisions above them. Lions played the first half uphill and against the wind and Kempston made repeated attempts to take advantage of the conditions only to be rebuffed by determined defensive play by Thiel, Dear (MOM), Broughton, Taylor and Lancefield. Kempston were caught out by a few attacking runs from Lions, with a shot from Crace being saved and both Coates and Crace being brought down by defenders. One of the resulting free-kicks by Moriarty was on target but saved. Early in the second half Crace shot over the goalie's head but the ball was plucked from the air in an impressive display of agility. Kempston retaliated immediately, scoring with a shot from wide on the right wing. Lions looked likely to level the score but Kempston's goalie always denied them. Pushing players forward in search of the equaliser left Lions open to the quick break and they conceded another goal seconds before the whistle, but it was a superb team performance. Panto is back in Eaton Bray - and it has teeth!! It's been three years since families have enjoyed the fun of Edlesbray Players' seasonal spectaculars but the group is back with the funniest show yet. There's a novel twist to the classic fairytale of Little Red Riding Hood and a clue can be found in the title. 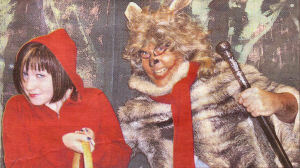 Little Red Riding Hoodie has been especially written for the players by director Pete Farrer with the aim of providing lots of laughs but keeping faith with the original storyline. "I've stuck fairly close to the original story but in this tale Red gets mugged on her way back from granny's house. "We try and make out that the wolf isn't really evil. He's just big and bad and a little bit misunderstood! "It's the first time I've had a go at this so I'm keeping my fingers crossed it will be all right on the night! "Things nearly didn't go according to plan when I walked out of rehearsals the other night and the wind blew my script away. We were all running around a graveyard in the dead of night trying to round up missing pages!" "We hope the public will enjoy this grass roots panto. I know there are a lot of professional shows around at the moment but we aim to inject a bit of fun and hope that everyone will enjoy watching it as much as we enjoy performing in it." Little Red Riding Hoodie is being performed at Eaton Bray Village Hall on January 24, 25 and 26, including a matinee performance on Saturday, Jan 26. Tickets are available from the Box Office (01525 222283). There is a licensed bar for all evening performances and a raffle. 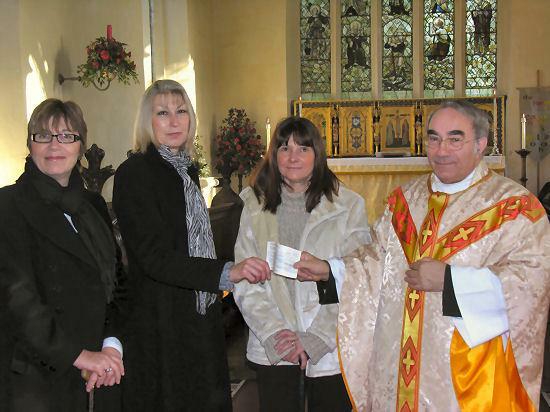 Parishioners from St Mary's, Eaton Bray and Edlesborough, have raised more than £6,000 in eight months for the Chilterns MS Centre at Halton in Bucks. The centre was the adopted charity for the church in 2007. Led by vicar and rural dean, the Rev Canon Malcolm Grant, the parish has been supporting charity projects for the past four years and last year's effort is their best yet despite also fund-raising to pay for essential repairs to the medieval church building. Mr Grant said: "The amount of money raised by people's hard work and generosity has far exceeded what we hoped for. For the past four years, we have had an annual parish project to raise funds for charities and concentrate efforts to make a real difference to people's lives rather than giving lots of little donations. This has been the best effort yet. People have been extremely kind hearted in their giving to others and this is the heart of what Jesus taught." The Chilterns MS Centre, which is a registered charity, offers treatment and support to people with multiple sclerosis. A team of professional staff treats 200 people each week at the centre and aims to keep patients as fit as possible, offering high density oxygen therapy, physiotherapy, complimentary therapies, and practical help with wheelchairs and benefits advice. It also offers support to families and carers. Pictured left to right: Linda Oatley, a trustee of the MS centre, Jan Hunter the centre's manager, MS sufferer, Heather Martin, and the Rev Malcolm Grant. Eaton Bray Parish Council has a vacancy for a Parish Councillor. To be eligible for co-option onto the Council you will need to be an elector over 21 years of age and have lived or worked within 3 miles of Eaton Bray for at least 12 months. Please see Become a Parish Councillor for more details. Learning to keep safe on the journey to school is childplay for youngsters at Edlesborough School who are celebrating the first anniversary of their walking bus scheme. Nearly 90 children join three "trains" each morning that make their way through Eaton Bray and Edlesborough to the High Street school and they get their first lessons in the playground. The school were given a £5,000 grant from Bucks County Council and used the cash to remark a play area with zebra crossings and road junctions to give the younger pupils a first look at the hazards faced by pedestrians. Debbie Dunstan, who organises the walking bus, said: "It's been a really successful year and we are delighted by the way parents are supporting the scheme. "The traffic chaos caused by parked cars outside the school is a lot easier in the mornings; it's a shame the same can't be said of the afternoons which are horrendous. "We appreciate a lot of parents drop their children off on the way to work but there are some parents who drive very short distances to school. We'd really like them to put their children in the walking bus." The agile U8 Blues went two for two with an impressive win over their village counterparts in an anticipated derby match. The Whites fought from the outset but were out gunned as the Blues hogged possession for a chunk of the game. Several searing shots sliced just offtarget or else were absorbed by accomplished keeping. An impressive header from Toby McGee brushed the post, while David Wood and Robert Bunting made imposing progress. Any Blues player could have scored, with shots driven forward by Daniel Challis and Sam Bramston. Ultimately Connor Tough placed a neat ball between the keeper's feet before the break, a lead consolidated in the second by Matt Kennell, powering in a decisive ball after ten minutes. Guarding the Blues' net, Ollie Mulcahy made short work of occasional incoming shots, but a challenging task was ameliorated by outstanding defensive work courtesy of Jack Reynolds and Bradley Hicks. This was the league cup semi-final and Lions did nothing wrong but not enough right. Every time there was a loose ball or two opposing players arrived at the same time it seemed that Lions just couldn't get that final touch or even when they did they couldn't use it to their advantage. Lions were playing a team they had beaten 7-1 a few weeks ago and yet from the start it was hard going. Lions seemed to be outnumbered (they only had seven)- maybe after the previous meeting, Tigers were more determined to get revenge than Lions were to confirm their superiority. Lions will learn from this and become a stronger and better team. Next week, they play the same team on the same pitch in the league so watch this space. Lions were forced to swallow a bitter defeat at the hands of an erratic Brache Sparta side. There were early indications that this would be a sapping match, with some blistering turns of speed coming from their effective right winger. Nonetheless, the pacey hitman's attacks were well countered by defenders Ben, James and Mason, while keeper Dan scooped up any tricky balls that penetrated the rear guard. Ultimately the shots would start landing, but it was testament to the Lion's iron-clad resolve that they retained a degree of celerity which would have undone many a foe. Sean, Tom and Chris were as ever using the length and breadth of the pitch, along with Charlie who demonstrated adept on-the-ball turns to frustrate the Brache defenders, but efforts would ultimately spearhead in a deft pass from Mason, angled into the net by deserving MoM Adam, to at least bring determined Lions team onto the scoreboard. The Lions progressed to Round 3 of the Cup. Lions took the lead early on, Scotty Mercer floating over a corner for Ben Flitton to volley into the goal. Thomas Lancefield made a great goal line clearance from a Sundon corner. However, Sundon equalised scoring from close range following a free kick. The Lions regained the lead, their second also coming from a corner. Jamie Holt crossed, Ben headed it on and Matt Bramston blasted the ball into the net. The Lions had the better of the second half but it took until the 23rd minute of the half to score the decisive goal. Matt Glover ran the ball to the goal line before cutting it back to Scotty who fired the ball into the net. Sundon scored a second in the final minute. MoM for the second week running went to Jakob Knappitt who was awesome once again. In one of the most stunning and exciting games, Eaton Bray Lions (2nd in Division 2) faced Caddington (2nd in Divisionl) in the 4th round of the Beds U12 League Cup. Lions powered their way to a 3-2 victory with a breathtaking hat trick from James Pearce (who scored his 200th Club career goal!). Captain Nathan Sears urged his team on and created some wonderful play from midfield to support the front two, Declan Tomlinson and Luke Dunstan controlled the defensive middle whilst Jack Bramston in goal made several stunning saves to deny Caddington. Haydn Thomas and Tom Nevitt were superb left and right backs who both attacked the flanks in a pulsating win to leave E B Lions in the last 16 of the Cup. Lions started strongly with good attempts on goal from Darcy and Hattie (GoM) giving them complete control of the game until against the run of play they conceded a goal. This didn't change Lions' approach to the game and Megan, Devon and Elsa kept control of midfield giving chances to get back on level terms. Lions' defence was solid with Katie, Beth and Abbey coping well with anything that came their way. In goal Nancy produced a couple of fine saves. Ten minutes into the second half, Sandy scored again. Lions continued to push forward but as the minutes ticked away they still couldn't get the goals they deserved. Once again Lions didn't get the result that such a committed and dedicated team effort deserved but with a team spirit as strong as this and the talent that this team has there will be good results to come. Are your house and car smoke-free? 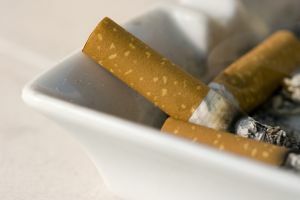 Householders and drivers are being urged to make their homes and cars smokefree. The Smokefree Homes project is aimed at raising awareness of the effects of second-hand smoke on health and cutting the number of parents who smoke in front of their children. Lianne Bowskill, from the Bedfordshire and Luton Smokefree Alliance, said: "Babies and young children are most affected by tobacco smoke. "Their lungs are still growing and their respiratory rates are faster which means that they breathe in more smoke. "As they spend most of their time on the floor, they breathe in more of the poisonous gases and toxic particles which cling to furniture, carpets and curtains long after the cigarette has been stubbed out." It took United about ten minutes to score through Zoe Molloy after some good play from Amy Gibbons and Amelia Enright who found her at the near post to score. Charlie (safehands) Hedges played well in goal with little to do. The defence of Georgia Carey and GoM Sarah Miller, stood firm to sopy any attacks. Maive Kenny played well in midfield. The second half saw Eaton Bray come out the stronger team, but United earned a penalty that Zoe converted in to the bottom left hand corner. Charlotte Mulford played well when she came on, as did Nimah Ryan. Are you a member of a community group who are unable to get a great idea of the ground because you're short of cash? If so, a More Active Grant from South Bedfordshire District Council may be just what you need. The grants of up to £300 supports one of the council's key ambitions to create a more active district and they allow local people to start up new activities within South Bedfordshire. The grants are available for community groups or talented individuals who pass a range of specifications which can be found on the South Bedfordshire District Council website. Last year has seen funding go to a number of people across South Bedfordshire including Robert Keogh from Dunstable who received £250 to buy cricket equipment and Linda Mallen,also from Dunstable who shows promise in athletics and has been awarded £250 for travel and accommodation expenses whilst attending the games in Vichy. All applications for the this year's grants must be received by South Bedfordshire District Council by May 2008. For details call community and leisure administration officer, Joan Allen, on 0845 8496323. School kitchen manager Tanya Watkin is enjoying a healthy helping of success, after winning a top title. Children at Eaton Bray Lower School are among the best-fed pupils in Bedfordshire, thanks to Tanya. Now the 34-year-old has won the county round of a national contest for school chefs. She was voted Bedfordshire's top school chef, in a cook-off for the National School Chef of the Year Competition. Next, she will go on to compete against chefs from around East Anglia in the regional heats. She said: "I'm really happy. I didn't think I'd win, I was surprised." Her husband Gary, and children Holly, eight, and Rebecca, six, who attend Eaton Bray Lower, were delighted by her win. And the school team was thrilled for her, too. Head Sue Hounslow said: "We are delighted for her. She works very hard as our school cook, she is fully involved in the life of the school. "For example, if the children are doing a topic on Vikings, then a melon is miraculously turned into a 'Viking longship'! "When they visit a butterfly farm, she'll make biscuits into the shape of butterflies - and she works really hard to make dinners special for the children." 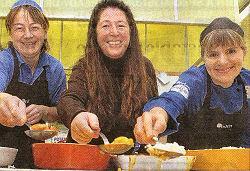 Tanya, who joined the school in March 2006, had to prepare four portions of a main course, and four helpings of dessert, for the contest. She cooked up tasty Tex Mex beef wrap, followed by banoffee yoghurt cup. 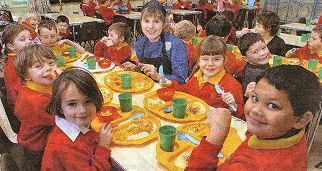 The aim was that the school menu idea should be suitable for 11-year-old pupils, and should be a balanced twocourse meal. And the dishes had to meet competition standards, but still be adaptable to large-scale catering. The judges took into account a wide range of factors, including flavour, colour texture, presentation, nutritional balance, the use of regional and seasonal products, working practices, creativity and service counter marketing. Healthy eating is one of the areas for which Eaton Bray Lower has won high praise. Last year, the school was awarded National Healthy School status, after excelling at meeting government guidelines in areas including healthy eating and physical activity. The school's healthy eating menu has been greeted with enthusiasm by the pupils, and the number of youngsters having cooked school meals has soared. Eaton Bray couple Frank and Peggy Franklin celebrated 50 years of happy marriage with a Saturday party at Leighton Rugby Club. Frank and Peggy met while visiting the Stanley Thurston Fun Fair at Wardown Park, Luton, and life's been a merry-go-round ever since. 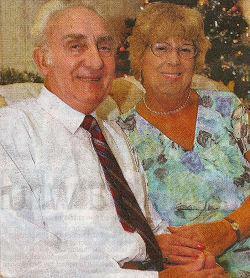 He proposed in September 1957, she said yes and they were married at Limbury Mead parish church. The couple have four children, 13 grandchildren and five great children and say the secret of their long and happy marriage is being able to "I'm sorry." They plan a celebratory cruise sometime in the new year. You are viewing the January 2008 archive.